Standardized UI for ALL flashlights! It’s not unusual for people to own multiple flashlights, perhaps for different purposes. The problem is that each flashlight has it’s own UI and requires learning. Sometimes you have to learn 5 different UIs and this is very ineffective. What if you need to light something fast? Like power goes out, it’s complete darkness and you need light fast. With so many different UIs you can easily get confused and start with strobe or something. Anyways, the bottom line is that there is no need for different UIs because the ramping UI is by far the best. Easy to operate and you select exactly how much brightness you want. There’s no need for 5 different modes. So ramping UI replaces most of the complicated and unnecessary extra modes. Also, electronic lock-out is useless. Nobody uses it! It makes turning the light on again a mess. So that’s another useless mode out. Same for beacon. Nobody needs that. The only useful extra modes are strobe, momentary and battery check and these can be assigned to multiple clicks because they are rarely used. Double-click should be reserved for switching leds, like on lights with multiple colored leds. That’s it. Very simple to operate UI. And all flashlights should have this. What do you think? How can we get all manufacturers to follow it? The firmware used by BLF from our own members is pretty “standardized”. Not officially by any governing organization, but at least recognized by manufacturers and enthusiasts. I would say that perfect for you is terrible for me. I support options and reprogramming capabilities. I’m all for this concept too, but we passed the on/off Maglight generation and flashlight technology, design, style, performance and execution has gotten so diverse I don’t think people can ever agree on one UI. You’ve asked everyone if they use it? I’d say the VAST majority of lights I’ve seen anyone own use mechanical switches or buttons, so any ramping that would require an e-switch is out simply because of that. If we really want to talk about muggle lights a simple 2-mode low/high UI is really the way to go. Anything else is a solution looking for a problem. This is not standardization, it is uniformization. What are we going to do with manufacturers and users not following the Great Standardization, send them to reeducation camps ? And people trying to innovate, will they be considered deviants ? Please keep in mind that not all people have the same preferences, needs and way of using things. little late for april fools day though. Sorry but it is ignorance to think that what works for you is the best and everybody have to line up. If it was true, there were no so many UIs. Some people do need electrical lock and other need strobe. Some need 1 mode and other 5 modes. Also it is not always possible to use the same UI on different lights with different HW. You can learn to flash UI and flash all your lights with the same UI that fits best for you. The lights with mechanical switches should only have 2 modes, hi and low. But the switch should only switch between 1 mode and off when using it normally. Why? Can you tell me a single rational reason why someone needs 5 levels when ramping can provide 1000s of levels? Just because people think they need something doesn’t mean they do. Most people believe they need a 4K TV or phone but in reality anything over 720p is an overkill. Just wasted energy for no benefit. Why would you need 1000s of levels when you just need 3. Why would you need 820 lumens when 800 makes no differences ? N.B. : Actually, there is no ramping UI with 1000s of levels. 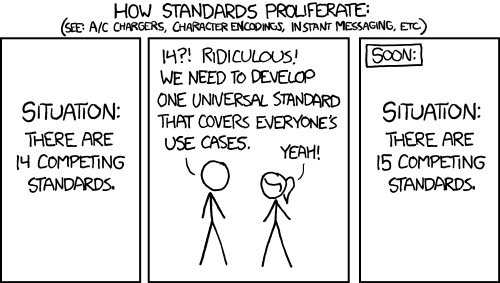 We cannot agree if we need standard UI or not, do you believe we can agree on 1 standard UI? Here is one reason: With ramping, you never know exactly at what output level you are, which means you can’t accurately estimate runtime. EDIT: There is no “One Ring to Rule them ALL” in what concerns to flashlights! Also, electronic lock-out is useless. Nobody uses it! How do you know that nobody uses it? Just because you don’t, it doesn’t mean nobody does. I use lock-out on my Nitecore Tip every time I travel with it to prevent accidental turn-on in the bag. I think you are barking up a wrong tree. The whole beauty of BLF community and the manufacturers that tailor to it is the variety that it offers. We all like different things, and having different UIs and flashlights gives us options. I have a driver with 3 constant current levels (no PWM) how do you plan to use your standard UI with it? A control ring (rotary) maybe ? This is just another “if it’s useless to me, it’s useless for everybody!” thread. Ignore. And that’s why we can’t have nice things. All right-thinking people agree that long-press for off is of the devil. Why can’t Linux standardize on one desktop, and all programmers settle for one programming language? SMH. Pretty much, yeah. Get out of your bubbles, kids, the world is far larger than that of your Fakebook circle. Finding a particular output quickly is a pain. EVERY ramping UI I have used is either too fast to get exactly the ouput I want, or too slow to do so with. I just want to point out this is absolutely untrue, at the average distance from a monitor or TV, with their average size the human eye can see WAY more detail than is even offerred by 4K. And what about photo/video editing? Surely those professionals have no idea what improves their product. That is a impossible to answer. What is rational to you may not be to me and vise versa. Sounds like you want to make a UI that you like and then everyone who doesn’t will just have to live with it. Then when you make changes to it we will have to adjust to that as well. Sounds exactly what we already have. Grab a driver. Program it to your liking and be happy. A standardized UI probably goes against what most flashlight enthusiast want. We like to modify and make things our own. To have one standard UI would be a insult to those of us who appreciate lights for what they are. Don’t be upset that lights don’t have exactly the UI you want. Find a way to make it yours. Get dirty, do some research, make it yours. Just don’t try to make it ours. How to program a driver? And why do I need to get a driver? Can’t original drivers be reprogrammed? Multiple UIs are a serious safety issue. Currently i have 4 recent lights with 4 different UIs and two more from from legacy lights. To my wife and any muggle, in a life and death situation, it may very well be death. That is why i am collecting what i like, but plan to buy a larger EDC and then make it standard in all the cars and house. About 6 lights. Currently, I’m buying the SP33 which may be it or the Convoy S2. My better half will then get the same training she got for using firearms. Blindfolded, rinse and repeat. Muscle memory. Maybe it sounds funny to some, but to me, it borders on lunacy to have an emergency tool that one needs to “figure out”. EDIT…we’re talking about it and her go-to is the Coast SP14. Back button, click on or off. Zero choices. Zero confusion. Zero panic. Good thing most lights with complicated UIs aren’t sold specifically as “emergency tools”. That’s what the single mode P60s, Pelicans, etc. are for. For emergency, it’s best to just get some single mode lights or ones that can be programmed to function as such. The simpler the better. Fancy UIs have their place, but not in this case. its as simple as 1, 2, 3! Olight has the PERFECT UI! The “panic” situation happened recently when we thought we heard something in our house. Watching tv and suddenly some loud noise……shut off the tv…..I quietly shuffle to the den and grab the Q8…she grabs the phone….I turn on the Q* and NOTHING…..oops, tighten it up…..ramp it up……shut it off so we have surprise advantage and wait for any new noises. Nothing. Do a quick tour to make sure nothing there. Take away is that I had a tiny WTF because I forgot that I unscrew the lights and had to hold it against my body to ramp it up. The Coast HP 14 is simply click on to full power. She would NOT grab the Q8 to investigate, she would grab the Coast. So now, I have to find a light that replaces that and put one in the kitchen, one in the bedroom, one in the family room and one in each car. So yes, the Q8 is a hobby light…and NOT a hobby light. It’s 5000 lumens not only flood the entire house or yard, but on an inside the house inspection, it’s light penetrates massively through the curtains and warns anyone outside that there is someone home.